The National Development Bank has given me a boost in seeing my business grow, says a local business woman in Lae. Louise Agerenga, 45 from Chimbu is a nursing officer with 25 years of experience that decided to do something outside of her medical field. She was operating a small clinic at her residence to service the local community where she lives especially mothers and children. But because she needed money to buy medicine supplies to help her community, Agerenga decided to venture into other businesses to support her clinic. “Since my husband Andy Apa from Jiwaka has qualifications in food technology from the University of Technology in Lae, we have decided to use that to our advantage,” she said. They were a long time citizens of Lae, Morobe Province and because they saw that fruits and vegetable supplies there are in abundance, they decided to utilise them. “Because we live in a tropical environment where there’s abundance of raw fruits and vegetables, we decided to use them in putting our knowledge and skills to use,” Agerenga said. So they began the wine making business called Tropical Wine in 2001. The fruits they currently use to make wine include strawberries which they get the supply from the local growers in the Highlands, pawpaw, mango and ginger, they collected them from the main local market in Lae. “There are so many challenges in running a business only when you face them without fear that you will be successful,” Agerenga said. They began employing local women and men to assist with the production. “When we go into wine production, we were faced with labelling and packaging issues as well as logistical support to assist us to go to and from the market as well as delivering of our finished products to customers,” Agerenga said. She was lucky to seek assistance from a company in Lae that assisted her with the packaging and labelling of her products. Then NDB went to her aid with their Women in Business Loan package and assisted her to acquire a vehicle to cater for her logistical needs. “So I was loaned K63, 425.43 from the Women in Business desk at NDB Lae branch,” Agerenga said. She bought her Ford Ranger which now makes her life easier to move around and do business faster. “I am now nearing the completion of my loan and I am thinking of getting another much bigger loan as NDB has assisted me to grow in my business,” she added. She is now three months away to fully settle her loans. 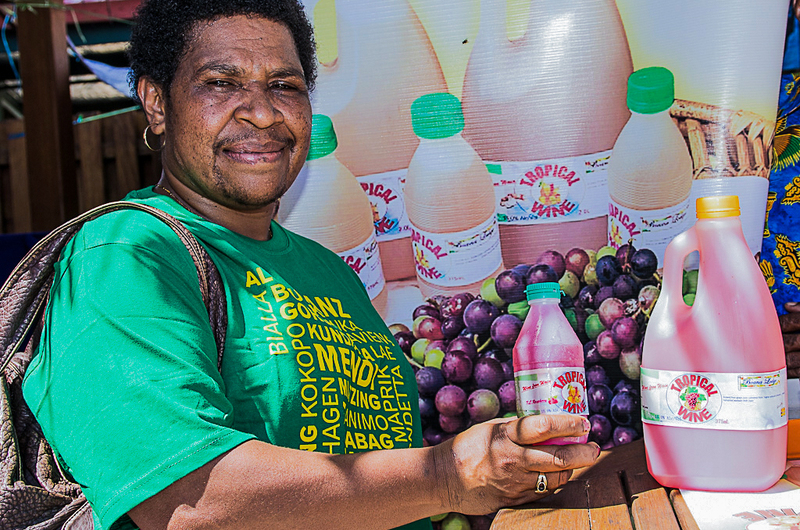 They have been supplying the local shops and resellers in Lae since then with about 100 cartons of 375 millilitres and 2 litre bottles every month. Agerenga said she and her husband were now planning to expand their business to other parts of the country and eventually to overseas. “I very much appreciates the bank for your support as I see the products you people offer is easy and can be accessible to any women in the country,” she said. So the next time anyone of you readers pays a visit to Lae, don’t forget to check the shelves in stores for Tropical Wine Products. Help support our local SMEs because they contribute to our country’s GDP. Top: Louise Agerenga bottles of Wine...from Wain, Morobe Province.